Today is the centennial of my father’s birth. He lived not much over half of that century, a period that has grown shorter in my eyes with each passing year. Dad loved music in many forms–opera, chamber, symphonic, piano, vocal, jazz, Big Band, and more. 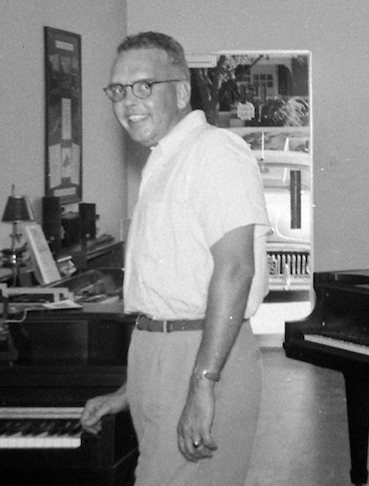 Around 1950, he opened Bruce Piano Company. The store sold Steinways and provided pianos for performers visiting the Fort Worth Symphony and Opera. We often argued during the years that were to be his last and my first as a nominal adult. There were the perennial favorites of politics and religion, but special features such as how I didn’t understand what it meant to grow up in the Great Depression, what was wrong with contemporary pop music, and how I would benefit from more direction in my life. I’m stubborn like Dad was, so my views probably haven’t changed much since then. Still, I’d give a lot to have the briefest time with him again, even if it were an argument. I might even be able to listen better. On the whole, I have fond memories and few regrets. However, one big regret is that he knew his children only as teenagers, and never met any of his six grandchildren and seven great-grandchildren. I know that he would have been very proud of all of them, and that they would have richer lives knowing him.